In all my years of involvement with professional baseball I've never experienced the drama of a wild card race like I did last night. Boston and Tampa Bay tied going into their final games. 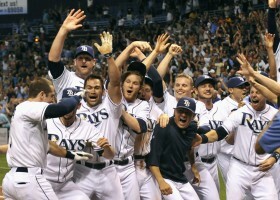 Rays down 7-0 to the Yankees and pull out an 8-7 win. Boston ahead 3-2 in the 8th and Baltmore squeaks out a 4-3 win. Tampa moves on. Boston is out. Same in the NL. The Braves fall apart and the Cardinals advance. Wow! What a finish!